Hina Jilani highlights the role of human rights in the struggle against discrimination as we mark the 70th Anniversary of the Universal Declaration of Human Rights. "As a lawyer and human rights defender, I have repeatedly been confronted with examples of discrimination committed on grounds of gender, race, religion or sexual orientation." Let me begin by mentioning the UDHR as a driver against discrimination which is a pervasive (and perverse) trait that consciously or unconsciously infects all our societies. It takes many shapes, forms and colours. I believe we have all witnessed discrimination in our lives against others, or else faced it ourselves. At the same time we have also witnessed many acts of courage to fight against this insidious evil at the national and international levels. As a lawyer and human rights defender I have repeatedly been confronted with examples of discrimination committed on grounds of gender, race, religion or sexual orientation. Minorities in particular have been denied opportunities for political, social and economic advancement because of discriminatory laws policies. In many countries of the world, the situation of women and girls is of particular concern. Their rights are violated in the name of religion and culture and they become particularly vulnerable to prejudice, to exclusion and to public repudiation for claiming rights, not only by State forces but by social actors as well. While states have progressively enhanced their powers of control the role of the state in protection has diminished. These trends continue to impede prospects for democracy, respect for human rights and the rule of law, and the potential for development and have left vast sections of populations vulnerable to marginalization and exclusion. "Laws and social policies adopted by states play a crucial role in eliminating social trends that result in discrimination and exclusion." As we commemorate the 70th Anniversary of the Universal Declaration of Human Rights I am sure that we are all fully conscious that deviations from and non-compliance with the principles expressed in the Declaration have presented the global community with some of the most complex social, political and economic problems. The pace at which consensus evolved to lay down these standards as a measure of state conduct or social progress, has been overcome all over the world by a rapid sequence of events. These events have generated conditions causing more grievous violations of human rights than were witnessed during the war that preceded the Declaration. Human rights today are hostage to territorial disputes, ideologies based on religious or economic doctrines, and conflicting security interests. The Universal Declaration of Human Rights is meant to be an affirmation of our collective beliefs. Yet we witness an unacceptable level of tolerance for injustice, exploitation and abuse. It is because of this adverse environment that emphasis on the universality of human rights has become essential for the protection and promotion of human rights. These values emanate from human experience limited neither to one part of the world nor to a single culture or society. Arguments against the concept of universality are no more than attempts to justify human rights violations and to legitimize action contrary to human rights norms taken in the name of religion, nationalism or ethnic identity. Laws and social policies adopted by states play a crucial role in eliminating social trends that result in discrimination and exclusion. States bear the responsibility to uphold commitments, which they have solemnly entered into as a part of the international community. They are also obliged to enforce these against all those elements and non-state actors that perpetuate prejudices, denigrate the merits of diversity and commit gross violation of human rights. The UN Security Council and Human Rights Council have established many independent mechanisms to investigate gross violations of international human rights and humanitarian law. However, the value of their work of these mechanisms is yet to be sufficiently appreciated by states. This has resulted in weakening accountability and assurance of non-repetition. Lack of political will and cynicism over international law are the root causes of this malaise. "Effective judicial systems must be supported by complete judicial independence if people are to draw benefit from protections that are normally available under a constitutional framework." I agree with the view that the principles of the UDHR are under threat and I want to warn that one important factor that could weaken the UDHR, and jeopardise its moral foundations, is the selective application of its provisions. This selectivity has allowed many situations of serious human rights violations to remain immune from international scrutiny or accountability. The adoption of the UDHR was a significant advancement in multilateralism and the growing recognition of collective responsibility for the promotion of human rights, peace and development. The assurance that no one would be left unprotected must be sheltered against any trends that could undermine faith in the values enshrined in the Declaration or in the efficacy of the multilateral initiatives to end impunity. An intelligent and creative use of national and international mechanisms is now vital not only to strengthen democracy and the rule of law, but also to effectively counter trends that pose a threat to these prospects. Informed electoral processes that ensure genuinely representative democracies with ample space for citizen participation and credible accountability systems need to be promoted. Effective judicial systems must be supported by complete judicial independence if people are to draw benefit from protections that are normally available under a constitutional framework. Initiatives for legal empowerment of the poor to relieve social exclusion and discrimination, exploitation of labour, eviction from land and displacement, and for conferring the right to control over natural resources would contribute towards giving effect to the letter and spirit of the UDHR and the human rights framework that it has inspired. Such a move forward requires a productive relationship between states and the civil society so that people’s dignity and security is placed at the centre of any approach towards governance. The civil society has an important role to play in promoting understanding, tolerance and peace amongst diverse communities. Civil society actors make critical contributions towards advancement of democracy, institution building and monitoring the processes for accountability. Vigilance by well-informed civil societies, especially human rights organisations, and public exposure of double standards and politically motivated selectivity is the best way to honour and foster the values of human rights. In this way the Declaration could live up to its promise to reduce, if not completely end, the discrimination that plagues so many lives around the world. 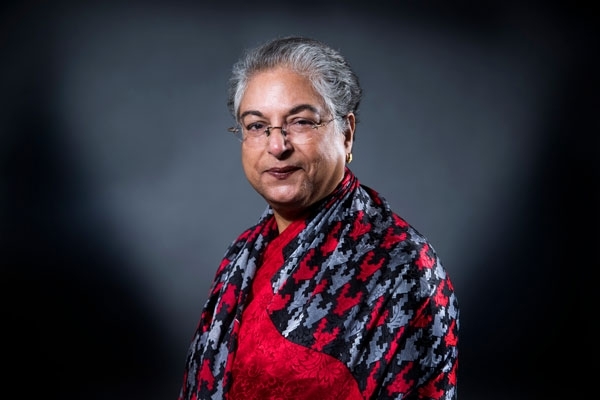 On 26 September, Hina Jilani joined a high-level event to mark the 70th Anniversary of the Universal Declaration of Human Rights. Following opening remarks from UN Secretary General António Guterres and UN High Commissioner for Human Rights, Michelle Bachelet, Hina Jilani explained the role of human rights in the struggle against discrimination. The event was hosted by the governments of France, Germany, Costa Rica, South Korea and Senegal during the 73rd UN General Assembly. Pioneering lawyer and pro-democracy campaigner; a leading activist in Pakistan's women's movement and international champion of human rights. 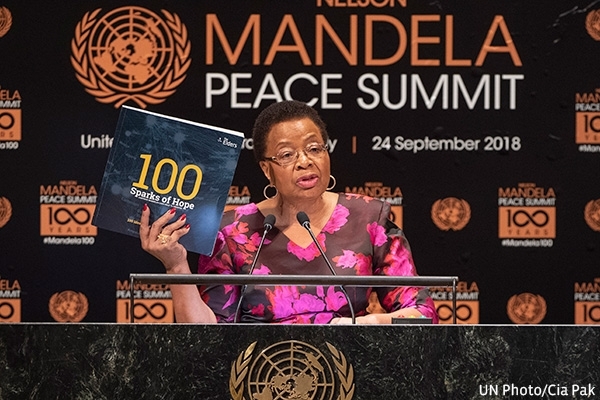 Addressing the Nelson Mandela Peace Summit at the 73rd UN General Assembly in New York on 24 September, Graça Machel reflects on the purpose and relevance of an empowered United Nations dedicated to achieving a better world for all. 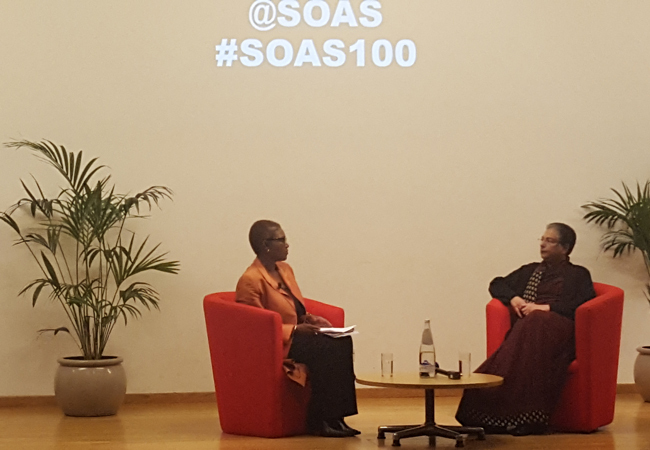 Speaking at London’s School of Oriental and African Studies (SOAS), Hina Jilani highlights the key role that human rights defenders play in preserving human rights as a universal value. Lakhdar Brahimi shares his personal experiences of the importance of education for women and girls.